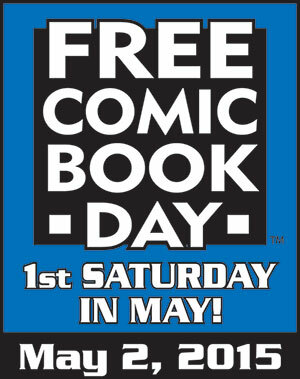 Saturday, May 2, was Free Comic Book Day all over these United States. Hopefully all of you reading my blog already know that. If not…well, I’ve failed you. Free Comic Book Day (FCBD) is the brainchild of comic store owner, Joe Field. I’m fortunate enough to have met Joe during the 90s and enjoyed talking to him about his take on how to run a store. A short history of the day is written here by John Jackson Miller much better than I could attempt. This is the fourteenth year for the annual event. If you’ve never been to one, shame on you. It’s your opportunity to snag free comics and check out new material. Interestingly, I told everyone I saw on Saturday that it was the second time I’d participated, the last time was two years ago. That’s part true. It was the second time I’d been at one of the cool local stores to promote comics (and myself), but the last time I did it was actually 2011. Wow, that was FOUR years ago. My how time flies. (and I just learned that the store where I signed books is no longer open. Very sad, because Heroes and Dreams was a very good store!). 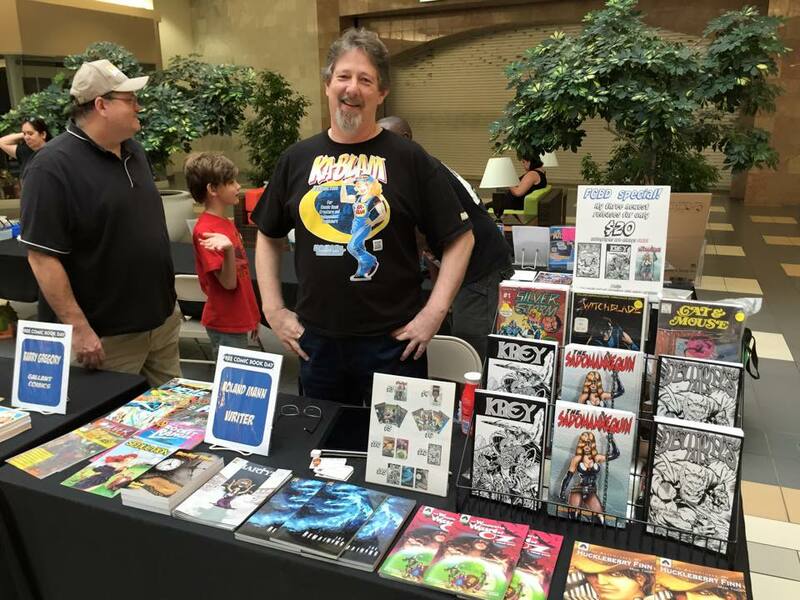 Me manning the table during FCBD 2015 at Coliseum of Comics Fashion Square Mall. You can see my pal Barry off to my right. This year I was honored to be a part of the creative assemblage put together by Aaron and his crew at Coliseum of Comics in the Fashion Square Mall in Orlando. To help matters, Avengers: Age of Ultron was playing in the theater right above us. Hundreds of folks turned out there, so I can only guess what it was like all over the US. The day was also made fun because I got to sit right next to my old pal Barry Gregory (and son, Fox). Barry was there pushing his new comic John Aman: Amazing Man. He’s also got a kickstarter going on to support the next issues, so you should consider going to support it! Speaking of kickstarters, Chuck Bordell’s Victor’s Horror Compendium was a success, so be looking for it. It contains a short Civil War ghost comic based on a short story I wrote. Chuck will be illustrating it and I’m very excited to see it! If he lets me, I’ll post some sneak peeks here, and also let you know where to go grab it if you didn’t pledge (shame on you!). Events up next for me are Space Coast Nerd Fest on May 24th (I’ll only be there the one day, but all day); Daytona Comic Con on June 7; and Leesburg Public Library Comic Con on June 13th. If you’re in the area then, come see me!